My kitchen is a lot like people. It's greatest strength is its greatest weakness. The 1935 space (renovated in 1997) is small. Happily, this makes it easy to clean...and quickly...since I am not covering a lot of square footage in the process. But it is small by new home standards, and though ample enough for me, it still has storage and flat surface issues. 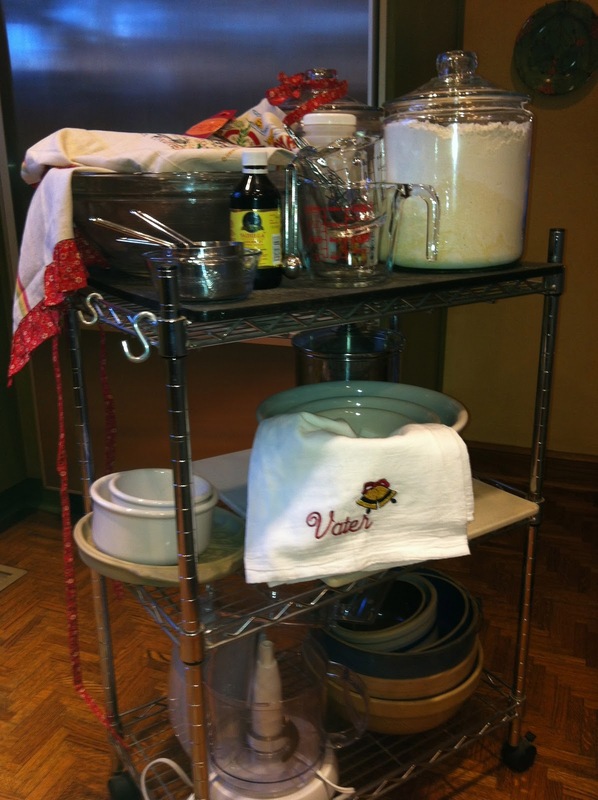 So a number of years back, I put together a baking cart that lives next to my refrigerator and rolls out as my baking whims arise. 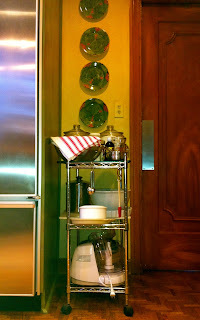 It holds, as you might expect, my canisters of flour, sugar, etc., my food processor, and measuring cups and spoons. Oh, and my favorite mixing bowls, a set of glass nesting ones. Find a set here if you think they might make a nice Christmas gift for a baker on your list.